Northern Italy’s Alto Adige region continues to gain worldwide recognition for its stellar white wine contributions. 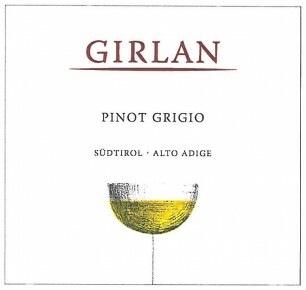 Girlan’s Pinot Grigio is light, crisp and dry, complemented by aromas of lemon, green apple and blossom. Straw yellow in color, this Pinot Grigio has a fresh, fruity nose and a soft, delicate palate. It can be enjoyed as an aperitif, and it also pairs well with asparagus, fish dishes, and white meats. Pinot Grigio has small bunches of rust-colored, almost brownish grapes; sometimes Pinot Bianco and Pinot Grigio grapes can be found on the same vineyard and belong to the same family of Burgundy Pinots. The grapes are picked by hand and placed in small containers to prevent excess pressure on the grapes. Gentle whole cluster pressing and clarification of the must by natural sedimentation. Fermentation in stainless steel tanks at a controlled temperature, a small part is continued with malolactic fermentation. Aging on the lees in stainless steel tanks.